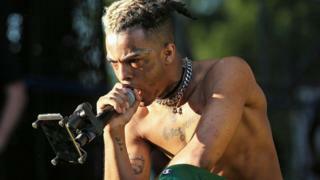 The killing of US rapper XXXTentacion has set social media ablaze: vicious arguments have broken out about how to memorialise such a problematic figure, as fans pore over conspiracy theories about the perpetrator and even question if the rapper was killed at all. Florida police have confirmed the 20-year-old, born Jahseh Dwayne Onfroy, was shot dead on Monday. Despite this, fans are probing videos purporting to show him after the shooting. Posts online point out potential discrepancies in his facial tattoos and question the lack of visible blood, bullets and shattered glass in the footage. Some suggest his death was faked as part of an elaborate prank for a future video release. A video from several months ago of XXXTentacion denying his own death (after an apparent suicide prank on his own channel) has also re-circulated widely, leading to further confusion. Two other Florida-based rappers - Soldier Kidd and Soldier JoJo - have been forced to deny they were behind the murder. It was suggested by some that photographs and videos they had shared online alluded to his killing, and had been recorded close to the scene. One particularly scrutinised Instagram post by Soldier Kidd showed the pair posing in a car with a red mask. A similar mask was allegedly mentioned in a 911 dispatch sourced by entertainment news website TMZ after the Tuesday shooting. Both rappers have made posts explicitly denying involvement and offering their condolences since. "If I'm gonna die, or ever be a sacrifice, I want to make sure that my life made at least 5 million kids happy - or they found some sort of answers or resolve in my life. Regardless of the negative around my name." These are the words of XXXTentacion himself in an Instagram story that seems to foreshadow his own death. Since Tuesday, social media have been torn on how to appropriately memorialise the young rapper. Fans say he should be remembered for his music but critics say his violence and criminality should define his legacy. This debate plagued, but ultimately did not really hinder, his career. He spent much of last two years in and out of jail or on house arrest. At the time of his death he was awaiting trial for beating and falsely imprisoning his former partner, Geneva Ayala, having already pled no contest to charges of home invasion robbery and aggravated battery with a firearm in a separate case. Some say his music soared to the top of the US charts because, not in spite, of his criminal record, having gained prominence over his cases. Capital Records signed him for a reported $6m (£4.5m) at the height of the controversies despite rumours of staff objections to the deal. Earlier this year his music was briefly blacklisted from Spotify's playlist system, alongside R Kelly's, under a policy against "hateful content and hateful conduct". The blacklisting was criticised as subjective. When New York Times journalist Joe Coscarelli approached XXXTentacion's team for a response, they simply responded with a list of other artists accused of abuse and violence who were not being impeded by the platform. The policy was reversed after industry giants threatened to pull their music. On Tuesday, after his death, Spotify were promoting XXXTentacion's music again alongside a tribute - leading to renewed criticism and accusations of hypocrisy and exploitation. Since his death, downloads of his albums have soared on Amazon, according to Forbes magazine. Music critic Craig Jenkins, who works at New York Magazine, has been attempting to shine a light on the problematic nature of some of contemporary rap's most controversial figures for some time now. Writing last year, he questioned the meteoric rise of stars like XXXTentacion, Tay-K and Kodak Black amid violent criminal charges. "A court case used to be an imposing obstacle for an artist's growth, a setback artists fought for their lives to overcome, but in 2017, assault and battery cases don't seem as damaging," he wrote. "In the same way that selling drugs sharpened Jay-Z and Snoop Dogg's bona fides in the '90s and getting shot nine times transformed 50 Cent from neighbourhood rabble-rouser into a spokesperson for the streets in the aughts, proof of a young rapper's reckless abandon now grows his legend and emboldens his authenticity." Amid #MeToo and #TimesUp, fans of all entertainment forms are grappling over whether we can, or should, separate an artist's work from their personal controversies. Tarpley Hitt, from the Miami New Times, wrote a profile of XXXTentacion's career and controversies earlier this month. She asked the rapper what he thought of the controversy surrounding him. "He was so unapologetic about it when we talked - he was literally the opposite of apologetic," Hitt told the BBC. "It was weird - he was interested in bettering his image but he wasn't interested in owning his crime." XXXTentacion didn't give many interviews, preferring to interact with fans directly through social media. This often courted further controversy and conspiracies like the ones that have spread since his death. It also led to his accuser, Geneva Ayala, being harassed. She told Hitt this had forced her to leave her job and had led to a GoFundMe appeal for reconstructive surgery being shut down after fans trolled it with complaints. "The fans that sought out her to harass her, that to me is so indefensible, horrible and crazy," Hitt said, after interacting with several online. But she relates to the confusion felt by fans who are troubled by allegations while still enjoying his music. "I think that is really one of the trickiest things in pop culture right now," she said.